This is a very simple laddu. 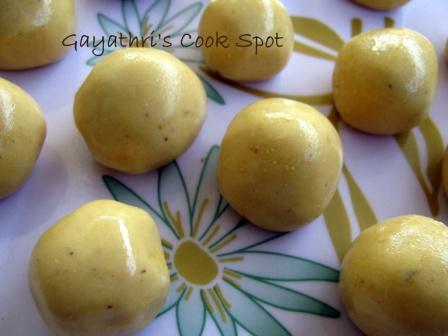 Ghee is used as the binding ingredient in this laddu. Actually the mixture of fried gram powder and sugar powder added with ghee must be crumbly and when you shape them into laddu you need to give lot of pressure. When cool the laddu melts in the mouth. I added extra ghee, so the laddu dried after a day. It was so tasty but it didn’t hold shape on the day of preparation. 1. In a mixer grinder grind fried gram and sugar to a fine powder. 2. Add cardamom powder and mix well. 3. Heat ghee and add little by little to the mixture. If needed add more ghee. 4. With the help of a spoon, mix it well. The mixture should be slightly crumbly. 5. Shape into laddus. Give lots of pressure to shape the laddus. If shaping comes very easy, then the laddus will not hold shape. Never thought of making laddoos with fried gram. Laddoos look smooth and perfect. A perfect simple delight,very easy to prepare. Love it anytime. Urs looks very delicious. On my first look i thought they were fruits…. You hv got very wonderful sapce…. Isn’t this the same as maaladu? It has come out perfectly. The maaladus have turned out super good..I love this, used to sit with my mom for making the balls. looks super gorgeous and irresistible..ladoo!! lovely and wonderful ladoos !! We call it maaladu and I take pottukadalai and sugar in the proportion 1:2. Maaladu looks fantastic..feel like having some.. The color and the texture of the Ladoo made it very tempting.. Remember having these when we were kids .. lovely urundais. yum! never heard of gram flour urundais.. must try ! bookmarked !! Yummy and inviting ladoos.. lovely click ! !